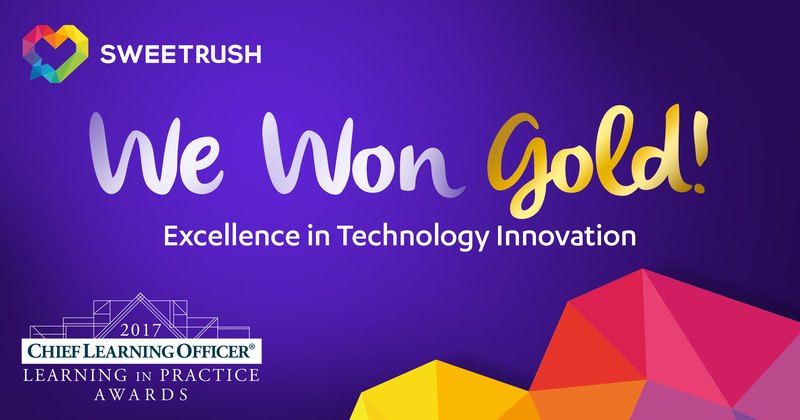 The prestigious award highlights SweetRush’s commitment to innovation and its investment in learning technology. San Francisco, Calif., October 30, 2017 — Chief Learning Officer magazine recently announced the winners of its coveted Learning in Practice Awards, and SweetRush won Gold in the Technology Innovation category. The award recognizes “vendors that have rolled out an innovative learning technology for a client.” SweetRush’s winning submission, which was created in collaboration with its client-partner Bridgestone Americas, is a scenario-based mobile learning game designed for a millennial audience. As sales associates play the game, they practice skills such as recommending products, overcoming objections, and closing sales. The game was developed in SweetRush’s proprietary learning technology Helium, which features sophisticated gaming elements and works on mobile platforms such as tablets and smartphones. The Learning in Practice Awards are given annually to learning leaders and providers who demonstrate excellence in the design and delivery of employee development programs. The full list of winners is available at the Chief Learning Officer website. Human Capital Media is a leader in the human capital management industry, delivering award-winning editorial content, events, research, and awards and benchmarking programs that give organizations the tools and insights necessary for success. The group’s brands include Chief Learning Officer, Workforce, and Talent Economy. For more information, visit humancapitalmedia.com.